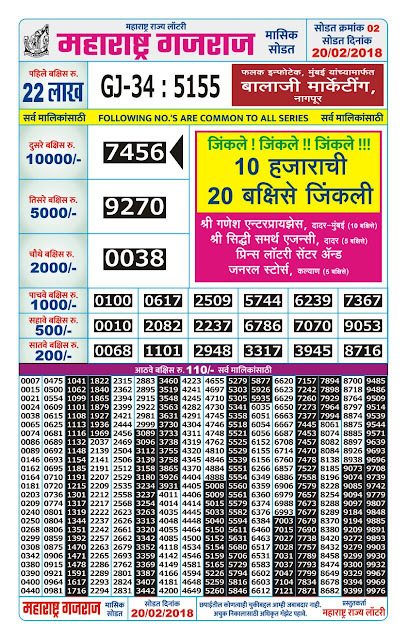 Maharashtra Gaurav Lottery is one of the monthly lottery scheme of Maharashtra Rajya Lottery, Government of Maharashtra. The results of Maharashtra Gaurav Lottery, May 2018 month declare on 16 May 2018. The results of monthly lottery declares third week of the every month. In this article, we talk about Maharashtra Gaurav Monthly lottery and know how you can check the results of Gaurav monthly lottery online. Maharashtra Rajya lottery is one of the famous, oldest lottery scheme which is approved and run by Government of Maharashtra. There are various schemes are run by state lottery of Maharashtra lottery department. You can know about those schemes and check results online of Maharashtra Rajya lottery. There are monthly, weekly lottery schemes offer by state lottery department. 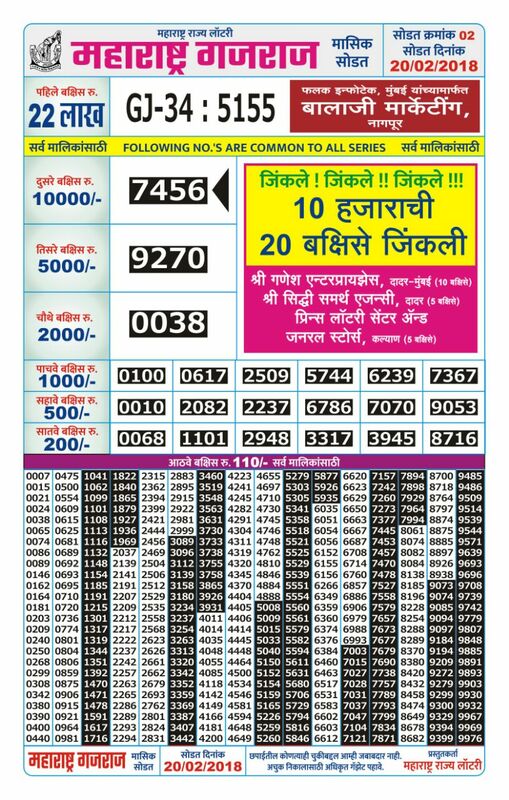 The monthly lottery schemes which offers a monthly lucky draw every month by the Lottery department of Maharashtra state. Maharashtra Gaurav is also a monthly lottery scheme which offers super bumper prize to the lucky winners, those who have purchased lottery tickets and matches all the lucky winning numbers through the department' lucky draw. Would you like to win big bumper prize of Maharashtra Gaurav Monthly Lottery? Then you have to buy monthly lottery ticket from authorized dealer and you should check that the lottery ticket must be labeled Maharashtra Rajya Gaurav Monthly Lottery. Here, we have given some details regarding Gaurav Lottery, what are the prizes are offer by monthly lottery schemes and how to become a lucky winner of the draw. The Government of Maharashtra is planning to start online lottery schemes very soon. According to recent survey by lottery department, they have noticed that small states like Kerala is making much more revenue through lottery schemes as compare to Maharashtra lottery department, who have printed lottery tickets in various states. So very soon we can see online lottery purchase option for Maharashtra Rajya Lottery. But, today, if you want to buy lottery tickets of Maharashtra Gaurav monthly lottery, then you have to buy it from legal, authorized dealers only. We have mentioned the steps and process of how you can get a lottery ticket offline. Online option will be available soon. To buy a monthly lottery ticket, weekly lottery ticket, daily tickets, you must purchase from authorized lottery dealer who are representing the government lottery department with authorization by the Government of Maharashtra, Lottery department, Mumbai. The lottery dealers are available at city places as well as villages areas at Bus stand, railway stations, marketplaces or can have stalls near to your area. You can also check lottery results to those authorized lottery centers when results are declared. If you want to know how to buy Maharashtra Gaurav Monthly Lottery online? I don't know whether this lottery is available online for purchase or not., but very soon government may provide legal process to purchase lottery tickets online. How To Participate Maharashtra Gaurav Monthly Lottery? Interested to participate in Maharashtra Gaurav monthly lottery scheme? 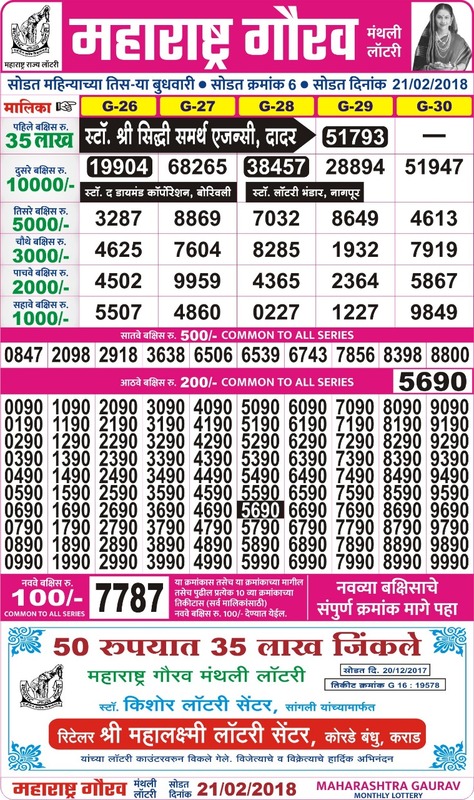 Want to win big prizes in Maharashtra Rajya lottery then you need to buy lottery tickets to participate in the draw. Very simple, you have to buy lottery tickets from authorized dealers. The lottery tickets are pre-printed format at lottery centers. You have to check the lottery schemes, weekly, daily, monthly lottery and pick the ticket according to your lucky number or you may pick any random ticket from the available tickets. The results of Maharashtra Rajya Gaurav Lottery declare on the same date which is printed on lottery ticket. So keep remember the date of results and check lottery results online. The results are declare on the same date on official website of Maharashtra Rajya Lottery. Have you purchased lottery ticket of Gaurav Maharashtra Rajya monthly lottery and want to check results of this lottery scheme? The results date of the Maharashtra state Gaurav lottery is printed on your lottery ticket. Check the date of results and you can find lottery results on that day's evening after 6 PM on the official website of Maharashtra State lottery department. You can also check this lottery results offline at authorized dealers. To check lottery results offline, you have to visit lottery center from where you have purchased those ticket, and ask for the results gazette. Note that, the results will be available on next working day to those centers. But you can find the lottery tickets results online any time. Match your lottery ticket numbers with lucky draw results and find if you have won any prize or not. The results of May 2018 monthly lottery are available online. You can check official result of Maharashtra Lottery Gaurav Monthly scheme online to find whether your lottery ticket numbers are winning any prize or not. We have listed the number of prizes which are awarded by Maharashtra state lottery to lucky winners whose ticket numbers matches with lucky draw. Following are the number of prizes, prizes awarded amount and total number of awards. Our team Congratulates to all the lucky winners who got lucky in this month lottery draw of Gaurav Monthly Lottery of Maharashtra State Lottery of Maharashtra Government. Have any Questions or Want Suggestions? Post your query in comment box and we will try to help you in Maharashtra State Monthly Lottery Schemes and Results.